Echternach is a touristic town in the East of the Grand-Duchy of Luxemburg in the region of the "Small Luxemburgish Switzerland" and in the Luxemburgish-German National parc. 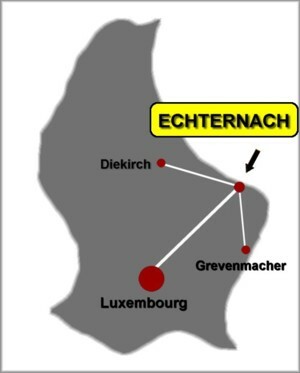 Please visit the internet pages of the municipality of Echternach to have more informations. Echternach is about 30 kilometers away from the capital Luxemburg. Start and Finish of La Charly Gaul are located in the center of the town, on the market place (place du Marché) next to the Basilika church. Registration is in the cultural centrum "Trifolion" (rue des Ecoliers), next to the Basilika-church and near the Start-Finish area. 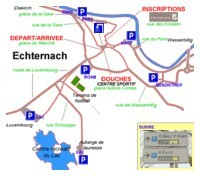 Showers and changing rooms are in the Sports Centrum (Centre Sportif) of Echternach (place Isidore Comes - next to the Bus Station / place de la Gare). For parkings spots, please follow the parking guidance system the municipality of Echternach, which will take you to parking spots with empty places. We advise you to use the parking place "ROAM" as well as the spots at the recreative centrum at the LAKE. They are situated on the route de Luxembourg, at the entry of Echternach when coming from Luxemburg. 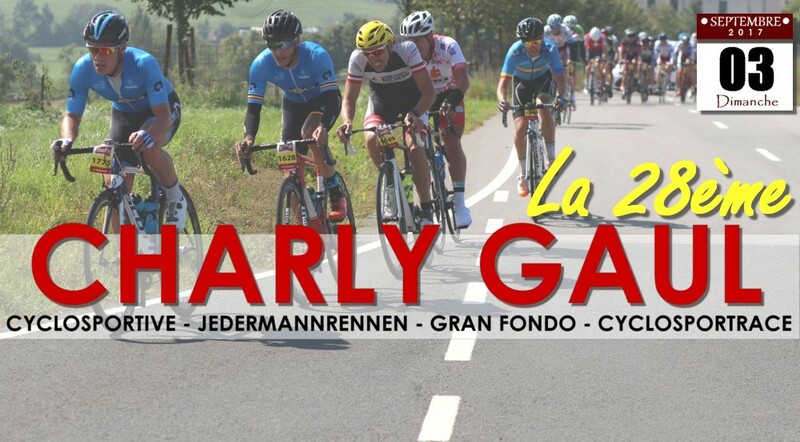 Near to the start-finish area, there are some more parking places called "GARE" and "PARC", which can be accessed easily through the rue de la Gare when coming from Diekirch, as well as the parking places "KACK" (in the rue du Pont) and "BENEDIKTINER", easy to find when coming from Wasserbillig. The parking BENEDIKTINER is NEW since last year and can be accessed from the rue de Wasserbillig via rue des Bénédictins. It has a capacity of 135 places, of which five are reserved camping-cars.